An industrial bulletin for Tube workers, by Tube workers. This issue focuses on the RMT/TSSA "Every Job Matters" dispute to save jobs and stop ticket office closures. It also includes an article on global LGBT struggles, as well as your local and workplace stories. A special edition of the industrial bulletin Tubeworker, produced in time for the launch of the "Hands off London Transport" campaign on 16 January. This issue focuses on discussing strategy for the fight to save jobs and ticket offices. A special edition of Tubeworker, a bulletin by Tube workers, for Tube workers, mobilising for a yes vote in the ballot for strikes to defend jobs and stop ticket office closures. A special issue of Tubeworker discussing the campaign against London Underground bosses' announcement of nearly 1,000 job losses and ticket closures across the entire network. An industrial bulletin for Tube workers, by Tube workers. 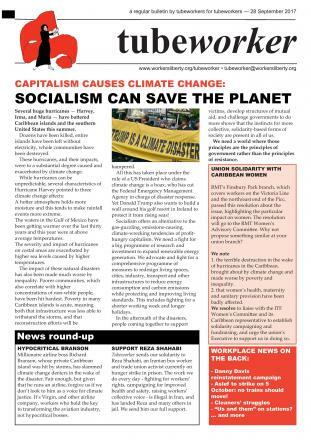 This issue features a discussion of the fight we need to stop job cuts, a reminder of victories we've won, plus your local and workplace stories. This issue discusses the Tories' workfare policies, cleaners' struggles, and the ongoing firefighters dispute. It calls for support for Brian Munro in the RMT Executive elections, and includes your local and workplace stories. An industrial bulletin for Tube workers, by Tube workers, discussing the London Overground guards' fight against job cuts, attacks on the TfL pensions scheme, and the sell off of 55 Broadway, plus your local and workplace stories. A bulletin for Tube workers, by Tube workers. This issue discusses the 12.5% cut to TfL's budget, the unwelcome return of "mobile station supervision", a mobilisation against the EDL in East London, plus your local and workplace stories.